Anterior knee pain may occur after total knee arthroplasty (TKA). Patellar resurfacing, which is considered to lower the incidence of anterior knee pain after TKA, remains controversial. In the present study clinical and radiological outcomes after TKA performed on patients with clinical and radiological signs of femorotibial and patellofemoral osteoarthritis (OA) with and without patellar resurfacing will be compared. Fifty patients will be included in a randomized controlled trial. Patients scheduled for TKA with clinical and radiological signs of femorotibial and patellofemoral OA will be included. Arthritis of the patellofemoral joint was determined based on the preoperative Baldini and Merchant X-ray views, which is assessed by the orthopaedic surgeon who treats the patient. Exclusion criteria are rheumatoid arthritis, history of patellar fracture, tuberosity transposition, high tibial osteotomy (HTO), hip arthroplasty and posterior cruciate ligament insufficiency. Patients will be randomized to undergo TKA either with or without patellar resurfacing. Outcomes will be assessed preoperatively, at 6 weeks and at 6, 12, 18 and 24 months postoperatively. Primary outcome measure is the patellofemoral scoring system according to Baldini. Secondary outcome measures are the Knee Society clinical rating system (KSS) and the Knee Osteoarthritis Outcome Scale (KOOS) scores. Conventional weight-bearing radiographs, and views according to Baldini will be used to asses component loosening, wear, and patellofemoral problems including fracture or loosening of resurfaced patellae, subluxation and wear of non-resurfaced patellae. There is no consensus regarding patellar resurfacing during primary TKA. Current prospective studies fail to determine any differences in clinical outcome among patients after TKA with or without patellar resurfacing. This randomized controlled trial has been designed to determine the effectiveness of patellar resurfacing during TKA in patients undergoing TKA who have clinical and radiological signs of tibiofemoral and patellofemoral OA, using a specific patellofemoral outcome measurement. Total knee arthroplasty (TKA) is a well-established surgical procedure, effective for relieving pain and improving function in patients suffering from osteoarthritis of the knee (OA). Studies have shown that more than 90% of modern primary total knee arthroplasties survive for at least ten years[2, 3]. Nonetheless, a substantial number of patients remains who have patellofemoral pain following TKA[4, 5]. Resurfacing of the patella is considered to be effective in lowering the incidence of anterior knee pain[6, 7]. Indications for patellar resurfacing during primary TKA, as described in current literature[8–11], include older age, anterior knee pain or other patellofemoral symptoms, rheumatoid arthritis (RA), obesity, history of patellar subluxation or dislocation, large and/or thick patella, a multi-operated knee joint and major loss of patellofemoral articular cartilage noted intraoperatively. Patellar resurfacing is not without drawbacks. Complications of patellar resurfacing include patellar fracture, tendon rupture, osteonecrosis and soft-tissue impingement[12–15]. Unsatisfactory results because of patellar tilt, maltracking, instability, polyethylene wear and patellar clunk syndrome have been reported[16, 17]. Unresurfaced patellae are subjected to high compressive forces, and may develop cartilage erosion after knee joint replacement. No studies found conclusive evidence that patellae affected by such changes become symptomatic after TKA[19, 20]. A meta-analysis including 1223 knees showed a 14% reduction in the absolute risk of postoperative anterior knee pain following patellar resurfacing during primary TKA (95% CI: 6–21%). By resurfacing the patella during primary TKA the risk of secondary patellar replacement was lowered by 5%. Recent reports fail to demonstrate benefits of patellar resurfacing regarding functional outcome. Some reports have demonstrated that secondary patellar resurfacing after TKA leads to inferior results compared to initial patellar resurfacing during primary TKA[22–24]. Other prospective studies fail to determine any difference in clinical and functional outcome among patients after TKA with or without patellar resurfacing[8, 11, 25, 26]. A recent randomised controlled trial (RCT) including 1715 knees showed no significant difference in functional outcome between patellar resurfacing or non-resurfacing during TKA (95% CI: -0.58–1.76) using the Oxford Knee Score. The inability to detect clinical differences may be caused by our lack of identifying those individuals who are thought to benefit from patellar resurfacing whilst avoiding potential complications. Furthermore, current scoring systems are unable to detect subtle differences in specific patellofemoral pain and function. The aim of the present study is to create a selective cohort of patients with clinical and radiological signs of femorotibial and patellofemoral knee OA who are indicated for TKA. All patients will be scored through the recent developed Baldini tool, a validated scoring system specifically designed to evaluate the patellofemoral joint[29, 30]. The hypothesis is that in our cohort of patients patellar resurfacing will show more than 10% improvement in the Baldini score compared to patients without patellar resurfacing 24 months after TKA. This paper reports on the study design of the PATRES (PATellar RESurfacing) trial. The study design is a randomized controlled trial: patients will be randomly allocated to have TKA with or without patellar resurfacing. The study will be conducted at the Department of Orthopaedic Surgery of Martini Hospital Groningen, the Netherlands, a secondary referral teaching hospital. One investigator will enroll the patients. Two orthopaedic surgeons will perform the procedure, and are thus not blinded. One independent investigator, not involved with enrollment or surgical procedure, will evaluate the outcome measurements. This investigator and all patients will remain blinded through the assigned regimen. The study has been approved by a Medical Ethics Committee, and is also registered in the Netherlands Trial Registry [Reference NTRTC3108]. Patients suitable for enrolment in the study are candidates for TKA with clinical and radiological signs of femorotibial and patellofemoral OA. Exclusion criteria are rheumatoid arthritis, history of patellar fracture, patellar ligament transposition, high tibial osteotomy (HTO), hip arthroplasty, posterior cruciate ligament (PCL) lesion and inability to read or write the Dutch language. All patients will be operated using the medial parapatellar approach and will receive a posterior cruciate ligament retaining all cemented total knee prosthesis (AGC® Total Knee System, Biomet, USA). Patella denervation and osteophyte resection will be performed in all patients with or without resurfacing[9, 10, 31]. In the patellar resurfacing group the patella will be resected to the appropriate size. The posterior articulating surface will be removed with the patella everted laterally. The resection will begin just below the subchondral bone at a level, which corresponds to the thickness of the patella component to be implanted. The aim of this procedure is to ensure maximum coverage of the cut surface without implant overhang. The one-peg all-polyethylene patellar prosthesis will be cemented in one stage with the tibial and femoral components. All patients will have the same postoperative rehabilitation regime. Primary outcome measure is the patellofemoral scoring system by Baldini et al. This tool represents patellofemoral kinematics more accurately, and may explain related patellofemoral complaints better. The scoring system includes objective and subjective aspects concerning the patellofemoral joint, ranging from 0 (worst) to 100 (best). Knee function will be assessed by means of two scoring systems: the Knee Society clinical rating system (KSS) and the Knee injury and Osteoarthritis Outcome Score (KOOS). 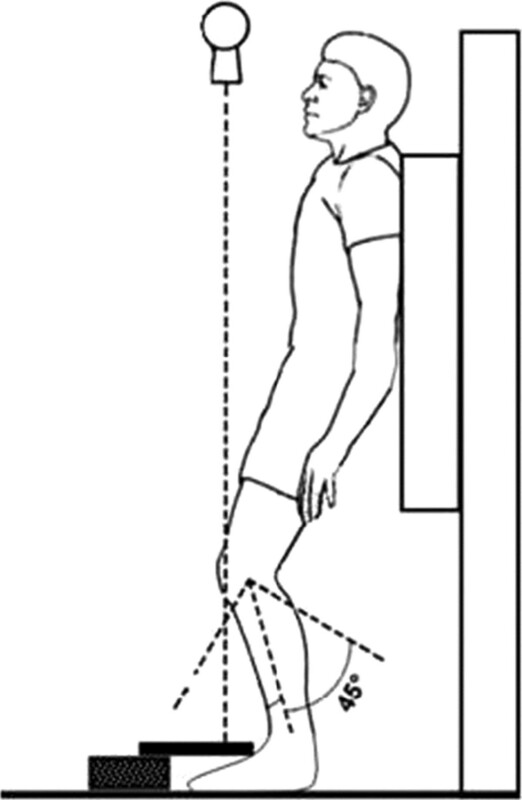 The KSS is subdivided into a knee score that rates only aspects of the knee joint itself, such as range of motion and stability, and a functional score that rates the patient’s ability to walk and climb stairs.The KOOS is developed as an instrument to assess patients’ opinion about their knee and associated problems[33, 34]. The KOOS consists of 5 subscales; pain, other symptoms, function in daily living, function in sport and recreation, and knee-related quality of life, with scores ranging from 0 (worst) to 100 (best). Component loosening, wear, and patellofemoral problems including fracture or loosening of resurfaced patellae, subluxation and wear of non-resurfaced patellae will be assessed on conventional weight-bearing radiographs and views according to Baldini. The view according to Baldini is a dynamic weight-bearing axial radiographic view of the patellofemoral joint with the patient standing in a semi-squatting position with knees in 45 degrees of flexion (Figure 1). Patients who meet the inclusion criteria will be informed about the study by their orthopaedic surgeon at the Department of Orthopaedics of Martini Hospital Groningen. They will be informed about the treatment and the risk of complications according to the Dutch Medical Treatment Contracts Act. After consenting to participate, patients will be randomly assigned to one of the two regimens in a 1:1 ratio (Figure 2). The schedule for randomisation will be randomly generated using a computer before initiation of the study. To conceal the outcomes of the randomization, the allocation numbers will be put into concealed, opaque envelopes. An independent researcher will prepare the envelopes. Following informed consent, a randomization envelope will be opened. The randomisation allocation will not be notified to either the patient or the independent researcher, as both patient and investigator will be blinded to the outcome of the randomization. Preoperatively as well as at six weeks, and six, 12,18 and 24 months postoperatively patient assessments will be performed. Age, gender, body mass index (BMI), severity of OA, will be recorded preoperatively. Perioperative complications will be registered. Primary and secondary outcome measurements will be obtained at all time points by an independent investigator (Table 1). Using the patellofemoral scoring system by Baldini et al., the sample size is based on a mean difference of 10 points between both groups at 2-years follow-up. To detect this difference of 10 points with a standard deviation of 8 points, alpha of 5% and a power of 90%, a sample size of 18 patients in each study group is required. To compensate for potential drop-out and loss to follow-up, a total of 50 patients will be included in the study. All statistical analyses will be computed using SPSS (IBM SPSS, Inc., Version 20.0, 2011). For the clinical parameters, t-tests will be used for continuous variables or the Mann–Whitney U-test when the variables are not normally distributed. A Chi-square test will be used for dichotomous variables. To assess differences in the results of the Baldini score and the KOOS over time between the two study groups, generalised estimating equations (GEE) analyses will be conducted. Longitudinal data are characterised by repeated observations of the same subjects. GEE analysis was developed to correct for repeated outcomes within the same subject. With a GEE analysis, adjustments for the effect of differences in patient characteristics on the outcome variables can also be made by including these variables as covariates. Both an intention-to-treat analysis as a per-protocol analysis will be performed. The need to resurface the patella as part of a total knee arthroplasty (TKA) remains controversial[12, 37, 38]. Several prospective observational studies have shown that approximately 10% of patients are affected by significant patellofemoral complaints after TKA, despite patellar resurfacing[39–41]. Selective resurfacing may improve clinical success by identifying individuals who will benefit from resurfacing the patella. In the present study all the included patients will have symptomatic patellofemoral OA as well as femorotibial OA. In our opinion this selection of patients provides a cohort that enables us to draw valid conclusions on patellar resurfacing with the use of the AGC total knee system. At our department the AGC® Total Knee System is used. This knee prosthesis has excellent longevity with minimal wear despite a flat-on-flat geometry and posterior cruciate ligament retainment[42, 43]. Emerson et al. showed a low rate of patellar failure in the AGC total knee system. Favourable component alignment together with unconstrained patellofemoral articulation most likely minimises patellofemoral stress. However, no specific patellofemoral scoring system was used in this study. Baldini et al. published a scoring system specifically designed to evaluate the patellofemoral joint before and after TKA. This scoring system is developed to determine function and pain, ranging from 0 to 100 points, and includes ratings for subjective and objective clinical aspects of the patellofemoral joint before and after TKA. This dedicated patellofemoral scoring system will be used in our clinical trial to improve the accuracy of the clinical outcome assessment. Feller et al. performed a prospective study with a self-made specific score for the patellofemoral joint and arthritis. No significant difference between the two treatment groups (resurfacing versus non-resurfacing) for their patellar score was found. Although the study of Feller et al. has a similar design as the current study, they did not use a homogenous patient group: by contrast, in the present study all the included patients will have clinical and radiological femorotibial and patellofemoral OA. The use of patient selection and a specific validated measurement tool allow us to expect to find a significant difference between the two groups that other prospective trials could not. Most of these studies use established clinical knee scoring systems, such as the KSS and the KOOS as outcome assessments. The KSS is derived from clinical and radiological data and concentrates mainly on the surgeon’s view of the outcome, i.e. knee pain, joint deformity and knee motion[44–46]. Patients are more concerned with symptoms and functional limitations. It is well recognised that clinical outcome assessments and patient-related measurements evaluate different aspects of knee injury and knee OA. Weak correlations and frequent discordance are found when comparing clinical outcome assessments like radiographic findings and knee motion to patient-relevant outcomes such as pain, function and activity level[47–50]. A patient-reported outcome measure, specific for knee problems, will thus be used in this study. The KOOS used in our clinical trial is developed to assess patients' opinion about their knee and related problems. The KOOS is a comprehensive instrument that includes five subscales assessing aspects of knee injury and knee OA considered important by patients. Most other instruments used for knee functional status combined items measuring different aspects into one score. An additional aspect in studies assessing outcome of TKA is a discrepancy between patellofemoral symptoms and results obtained by conventional scoring and radiographic analysis[47–49]. Regular scoring systems focus mainly on tibiofemoral aspects and specific patellofemoral symptoms can be missed or underscored. Commonly used clinical outcome measures, such as the KSS, do not take into account subjective symptoms or objective data specifically arising from the patellofemoral joint. The Baldini score represents an essential complementary source of information to the existing KSS and KOOS scores since both scores do not specifically focus on patellofemoral problems. Our study design is limited that results may not be applicable to other knee systems; especially posterior stabilized (PS) TKA. Alternative knee replacement designs may affect patellar kinematics differently. An in vitro study, however, showed similar quadriceps forces using CR or PS TKA systems. To our knowledge no clinical trials have been published to confirm these findings. 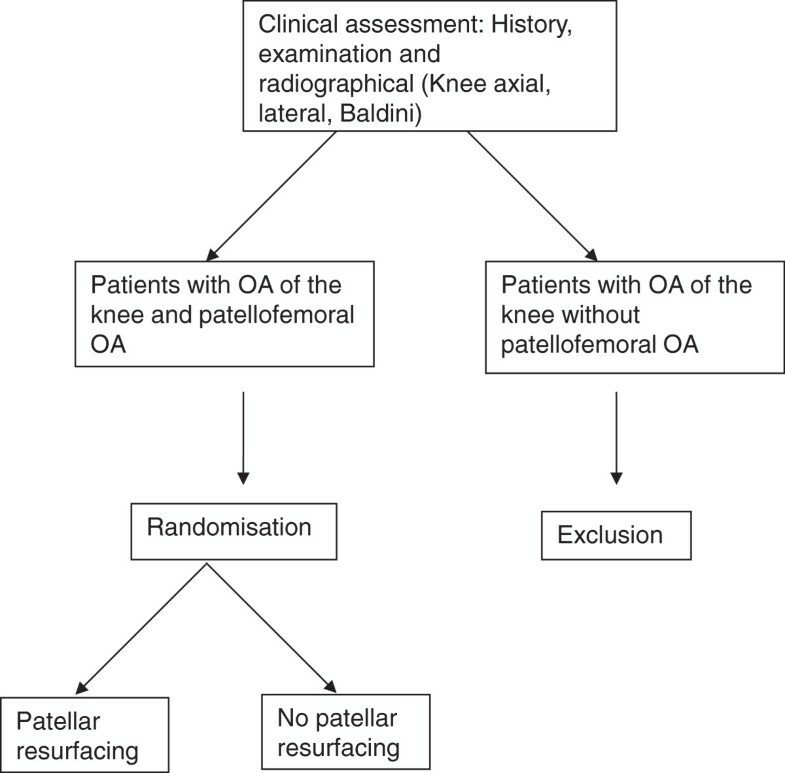 Previous randomised controlled trials on the effectiveness of patellar resurfacing during primary TKA have included patients with knee OA regardless of patellofemoral complaints. This trial studies a selected cohort of patients receiving total knee replacement. All included patients have clinical and radiological patellofemoral OA besides symptomatic femorotibial OA. This is a difference compared to previous randomised controlled trials that have included patients with knee OA regardless of patellofemoral complaints. Radiographic assessments used in clinical trials to evaluate the patellofemoral joint after TKA have remained basically unchanged for a number of decades, and do not accurately assess dynamic patellofemoral tracking following arthroplasty[52, 53]. Traditional radiographic assessment in a static unloaded position may not reproduce in vivo patellofemoral kinematics. On the commonly used tangential patellar axial view radiographs, the patellar position relative to the trochlea is independent of fundamental dynamic and neuromuscular factors[55, 56]. The role of the quadriceps muscle in affecting the position of the patella relative to the femur must be considered. Additionally, patellar kinematics are influenced by the axial and rotational alignment of the lower limb. Patients with patellofemoral problems following TKA typically experience anterior knee pain when the extensor apparatus is under load. Baldini et al. developed a dynamic weight-bearing radiographic view that reproduces a semi-squatting positional setting which sufficiently loads the patellofemoral joint and involves the extensor apparatus. This view according to Baldini will be used in our clinical trial because it allows for better assessment of patellofemoral OA and patellar subluxation. This paper describes a novel the design of a randomized controlled clinical trial on patellar resurfacing during TKA. A selected group of patients and the use of a specific patellofemoral scoring system will allow us to identify patients who will benefit from patellar resurfacing more accurately[29, 30]. This study can contribute to the decision making of resurfacing or not in primary TKA. TMvR and JJAMvR originated the idea for the study, led on its design and will supervise the project. MJFJB, IHFR, TMvR and JJAMvR participated in the design of the study and in developing the research protocol. IHFR provided statistical consultation. MJFJB will coordinate the trial and is responsible for data acquisition. All authors were involved in drafting the article or revising it critically for important intellectual content, and approved the final version to be published. None of the authors had a personal or financial conflict of interest. MJFJB had full access to all of the data in the study and takes responsibility for the integrity of the data and the accuracy of the data analysis. Study conception and design: MJFJB, TMvR, IHFR , JJAMvR. Acquisition of data: MJFJB, TMvR, IHFR, JJAMvR. Analysis and interpretation of data: MJFJB, IHFR. All authors were involved in drafting the article or revising it critically for important intellectual content, and all authors approved the final version to be published.